Is currently ranked first in both the Golfstat College Ranking and Golfweek/Sagarin Ranking, and is listed No. 2 in both the World Amateur Golf Ranking and Scratch Players World Amateur Ranking. Was the champion at the 2017 Northeast Amateur by two shots with an 11-under score of 265 over 72 holes. Reached the match play round of 16 at the 2017 U.S. Amateur after tying for eighth place in the medal portion of the tournament. Was runner up at both the Sunnehanna Amateur and the Trans-Mississippi Amateur last summer. Posted a perfect 4-0-0 record for victorious Team USA at the 2017 Walker Cup. Made the cut and finished in a share of 64th place (290, +2) at the PGA TOUR’s Arnold Palmer Invitational in March. 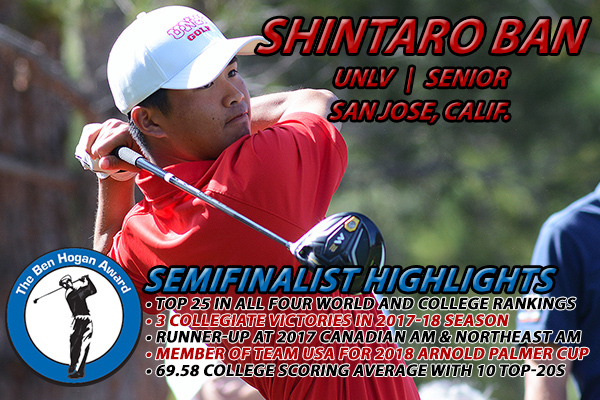 Played for Team USA at the 2017 Arnold Palmer Cup and has also earned a spot on the 2018 roster. Owns three collegiate wins this season, claiming the Western Intercollegiate, Wyoming Desert Intercollegiate and the Querencia Cabo Collegiate, where he broke the school’s 54-hole scoring record with a 197. Owns a 68.67 scoring average over nine events with 19 of his 27 rounds in the 60s. Has placed inside the top 5 in six of his nine college tournaments and has been inside the top 20 in every event.